After a whole stack of problems at Ari-Ben Aviator I've decided to switch schools. The problems are mainly due to delays. This is supposed to be a six month program, and yet after more than seven months I'm no-where near complete. The delays are mainly caused due to a lack of available airplanes. The airplanes have a lot of failures, they aren't in very good condition, and it just seems to take far too long for them to be repaired. So next month I shall be starting on the Flight Instructor couse at another school in Florida. It's a longer course and it will cost more, but it's much better quality and will make me into a better instructor! TOOK A TRIP..... TO CALIFORNIA! I had an offer to fly with somone I met at the airport in Ft Pierce to California. The trip took a couple of days, but made for some amazing flying! After landing I took a Greyhound bus to Los Angeles and picked up a car to drive back to Florida. The drive took 3 days, but allowed me to see a lot more of the US. I created a new Gallery for the trip. What a long day! Today was our long planned trip to Key West. 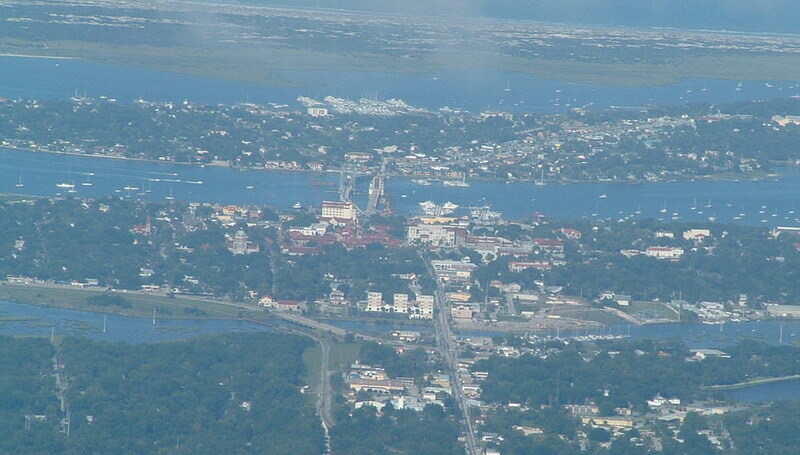 We flew down along the coast past ft Lauderdale and Miami at times as low as 500ft about a mile from the coast. Fantastic views of the buildings in Miami. It was a lot of work, as there is a lot of busy airspace down there and we had to keep switching from one controller to another. 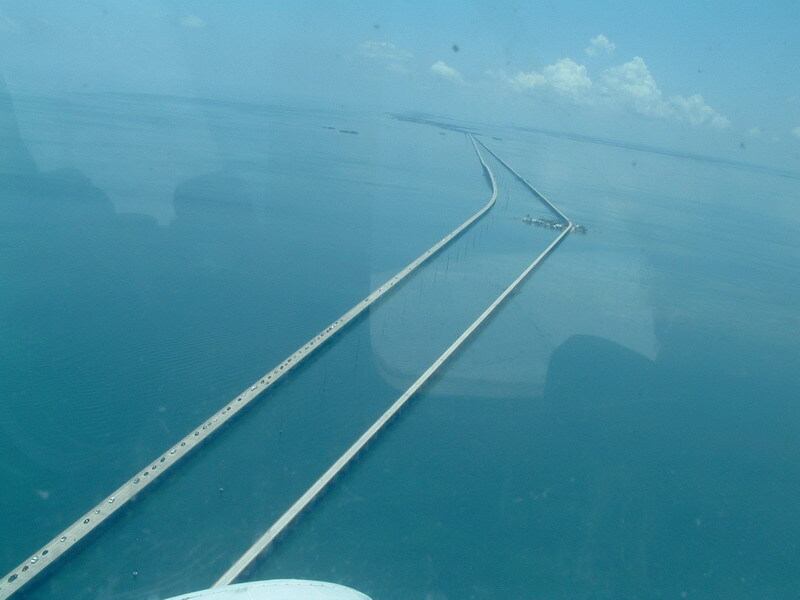 Past Miami and down along the keys was just fantastic. The water takes on a new blend of colours. Thousands of little boats were visible below us, and provided we stay at least 500ft away from them, we could go as low as we wanted! After landing we cycled through the town to the Ft Zachary state park, which had a nice beach to swim at, and had some dinner in town. Then we headed back to the airport and this is where our problems began. We Taxiied out to the runway without a problem and did our runup, basically testing that the engines accellerate smoothly, the tried to taxi onto the runway, but the plane wouldn't moved. We eventually managed to shift it to the side of taxiway, just in time for another plane to pass us and take off. We got out and saw the state of our front tyre. Totally flat. I walked back (a long way) to the FBO which fortunately was still open. One of the line guys drove me back to the plane on a tug, and we got towwed to the maintainence hangar. A couple of hours later, we were fixed up and good to go, after paying the $150 bill. (which I claimed back from the school here). Approach to landing at FXE was very impressive over the city. The FBO was very nice (no charge as usual) and we had coffee there before flying back. A high performance endorsement is required to fly any aircraft with an engine providing more than 200 horsepower (the duchess doesn't count since it has a total of 360 horsepower but only 180 for each engine). I need one for a flight I'm planning to do in the next couple of months, and the flight school I'm at here in Ft Pierce doesn't do it. We've taken a couple of flights up to a flight school in Daytona Beach who have a very cheap Cessna 182 for hire for only $144. A 182 is basically a larger version of the cessna 172 in which I did my private pilots licence, and with a 230 horsepower engine. Daytona Beach is a big airport right next to the race track for which daytona is famous, and a race was going as we flew in! On the first visit the plane wouldn't start, and we had to return the next day. This time it started first time! The plane was only a couple of years old (possibly the first plane I've flown which was younger than me!) with a full Garmin G1000 glass *censored*pit. We flew for 1.6 hours doing a few manouvers, landings and a couple of approaches, mainly getting used to the Glass. It's a totally different environment and takes some getting used to. I also had a play with the autopilot, which was good fun. Pretty much the entire flight can be programmed in, even an ILS or localizer approach, and you fly by pushing buttons and turning knobs. I posed for a pic and back to FPR. Anpother first for me, a flight up to Valdosta in southern Georgia. A very uneventful flight, until we approached Valdosta and were told to expect the ILS approach and realised we only had approach plates for Florida! Maybe some preflight planning would have been a good idea! The airport and FBO were very friendly, although it all looked very similar to any airport in Florida! 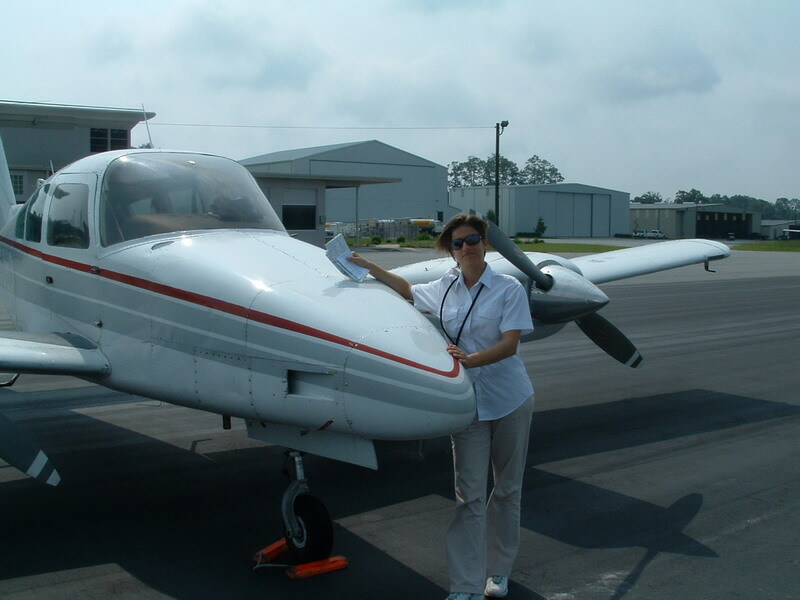 Picture below is of my safety pilot (we always fly the Duchess in pairs for the insurance, hence why I always write 'we') posing in front of our trusty steed on the ramp in Valdosta. Today I flew an Arrow up to Orlando Executive for a guy I met at the airport. Anything for cheap flighttime! It's a PA-28 similar to the pipers used for basic training everywhere, but with a retractable undercarriage and a constant speed prop. It wasn't the nicest or newest of planes, and the performance wasn't that good, but we made it. We had to take some big diversions around some thunderstorms, but the biggest problem was a failed mode C transponder. The transponder is radio device which responds with a code everytime it's 'hit' by ATC radar, which lets identify which radar return is which aircraft. The Mode C is for altitude reporting, which gives ATC the altitude you're flying at, and is required for flight within 30 nautical miles of Orlando International, including Orlando Executive. Our mode C was randomly reporting our altitude, at one point showing us at 800ft with 2000 feet per minute descent. Afrter ATC had recovered and accepted that we were cruising at 5000ft the whole time, he asked us to turn it off. We landed and went to a very nice terminal who asked us for a $16 ramp fee, waived with any fuel purchase. I bought a gallon at $5.29! The problem came with the return trip, as special authorisation is required to fly in the 'Mode C Veil' around Orlando without mode C, and I had to phone a couple of people for permission. That done, I carefully noted our authorisation number of our flight plan and off we went. It's been an interesting week. 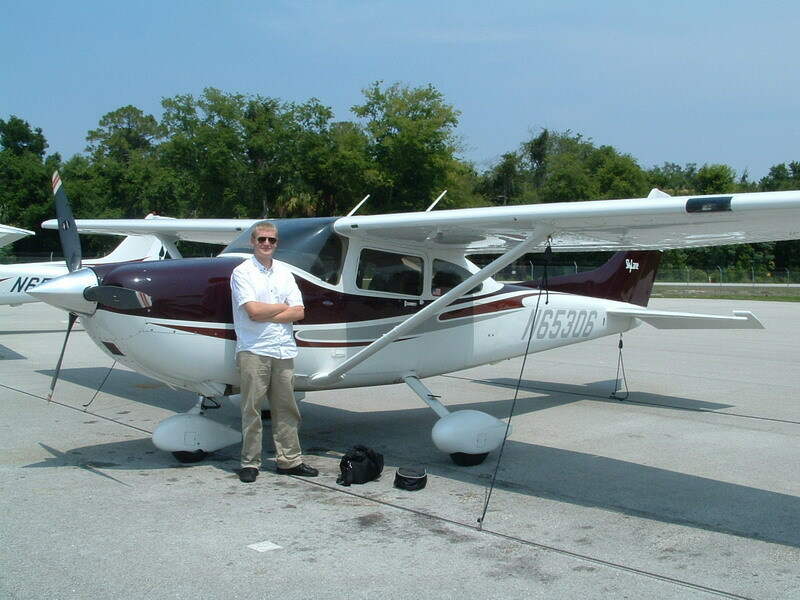 Florida is a fantastic place for flying light aircraft. Most of the airports have facilities designed not just for the small aircraft I'm flying but for corporate jets as well, and so the facilities on the ground are fantastic. Mostly they are free to visit as well. 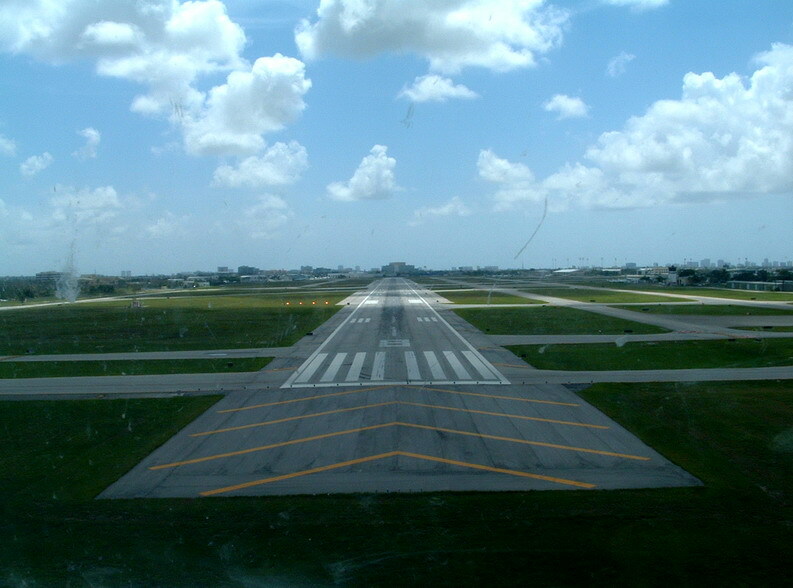 On Monday, followin a tip from another timebuilder, we flew to Fort Myers and Boca Raton, both of which supposidly offered cookies as well as coffee (which is common) to visiting pilots. Our mission was to decide which had the better cookies. First stop was Fort Myers. The flight over was very smooth, a nice easy landing and the guy in the tower was very friendly, manning both tower and ground frequencies that late at night. The airport is being developed, so he guided us along some unlighted taxiways and we parked up at the executive terminal. The ramp guy gave us a lift from the plane to the terminal in his stretch golf cart, and it was on to the cookie sampling. Very moist and not even slightly stale. Impressive for so late at night. We took a break in the pilots lounge for a bit, then headed for Boca Raton. Flying accross the centre of florida was amazing. A huge expanse of darkness below us, with the exception of a couple of fires which seemed to be burning pretty well. 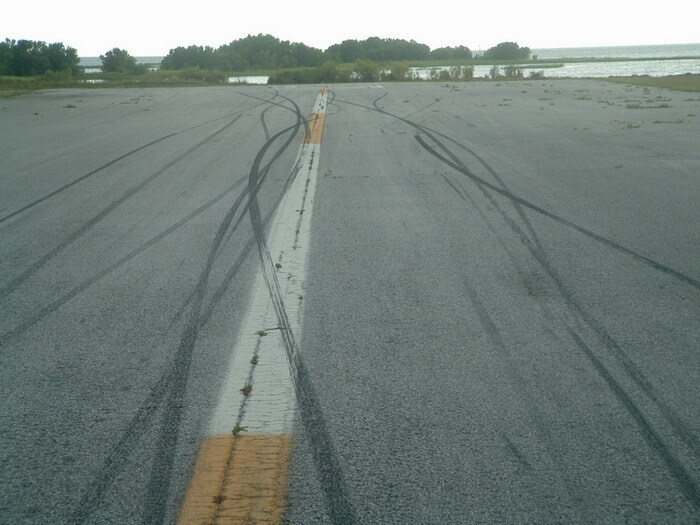 The approach to Boca was interesting. We had so much trouble making out the airport amongst all of the lights of the city. It's alongside I-95 and final approach takes you low over a highrise building and then over a major road junction at about 200ft. The Executive terminal there was again a very nice facility. The ramp guys there were all watching a basketball game, but one of them brought us a cup of coffee and chatted a bit. But the shock of the evening was that the promised cookies were nowhere to be found. I'm pretty sure it was due to the late-night arrival, so we will have to go back during the day to complete the challenge. We've also done a couple of morning flights. One to Naples was very nice, and they have excellent coffee. We looked at a flightschool there which does training for the JAA licencing. My co-pilot is more interested than I am at the moment. It's all way too expensive for me. we did a flight up to Daytona Beach which really convinced me that night flying is the way to go. Daytona Approach were really busy with all the flights going on, and one pilot on the same frequency as us managed to fly into somone's airspace and was 'given a number'. Something I hope never happens to me. They made other mistakes with us as well, flying us through the localizer course and having to turn us back, and forgetting to give us a frequency to handover to Orlando Approach on the way back. On top of that they tried to charge us a ramp fee in Daytona Beach, so we left without even a cup of coffee. Our next stop was Lakeland, which was a total contrast. Freindly controller and a nice FBO with a restaurant which we will have to visit later. The weekend was a total bust. 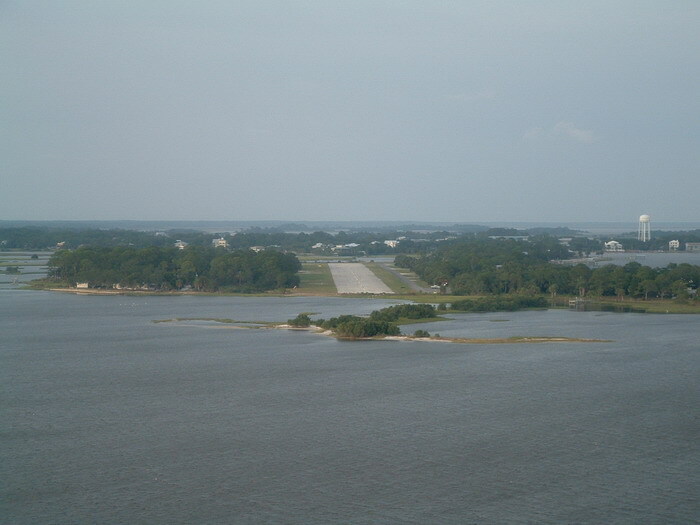 We had planned to fly up to St. Augustine to go to a nice restaurant on the shore, but our plane was grounded for maintainance. Yesterday the weather hit Florida pretty bad. There might be a Tropical Storm coming in. We had planned to go down to Key West and hang out on the Beach for a bit, but in the end we decided the weather was too bad for us to even take off from Ft. Pierce. It turned out it was a good decision. A plane crashed on takeoff right around the time we were scheduled to go. Apparently it was an engine failure, which shouldn't lead to a crash on a twin, but the weather might have been a factor. The weather looks bad today as well, we're on the schedule tonight so we'll have to see if it clears up. At least I have a good reminder not to go if I have any doubts. Another student and I took our first timebuilding flight on Saturday night, up to Tallahassee which is a flight we'd both made before. We left about 10pm played pool in the pilot's lounge of the FBO there for a couple of hours and flew back, landing at about 6am. Our next flight last night was one of the best flights I've had since I've been here. 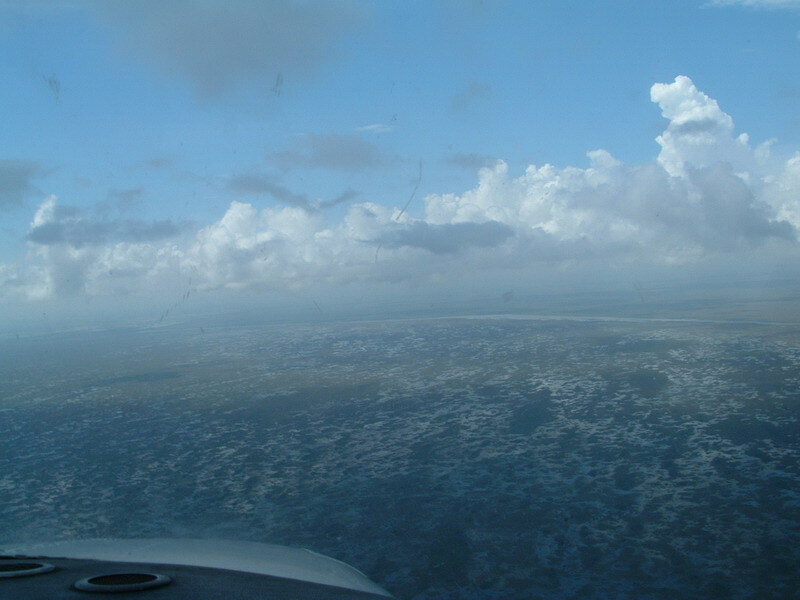 We flew up to Crystal River which is where I learnt to fly, skimming the clouds around the edges of some big thunderstorms. We went on up the coast at about 700ft to an isolated little island called Cedar Key in Norther Florida on the Gulf coast. We landed and backtracked to the parking area and when we powered down a man and his wife, in a golf cart (which you can just see in the picture) came over and offered us a lift into town! We stood on the back bumper for the 1 mile or so journey into town, with the cart struggling under the weight of the four of us, and the man told us about the history of the island and showed us some of the old buildings, before taking us to 'The Seabreeze On The Dock' which they claimed was the best restaurant in town. 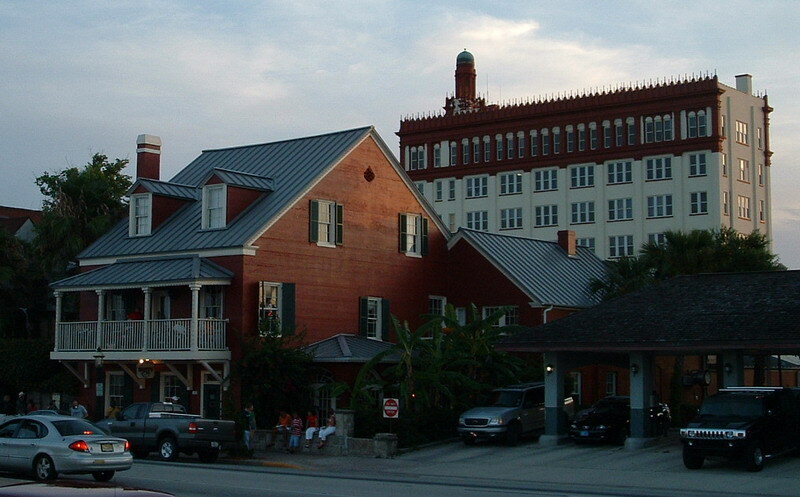 A really old building on pillings over the Gulf which did some great Seafood. After dinner we walked back through part of the town to the airport and flew back to Fort Pierce for a total flight time of just under three hours. It's been a long time between updates, mainly because not much has happened. I finished the instrument course and we ran into a few delays before scheduling my checkride. Tropical Storm Alberto and the thunderstorms around it left me waiting for good weather. Of course, you might say that good weather defeats the object of learning to fly on instruments, but smoother air makes it easier to pass the test. We were going to go yesterday, but we had a few mechanical difficulties, including one aborted take-off and eventually the examiner decided to give up for the day. So this morning, at 8am we finally have a plane working and clear blue skies. 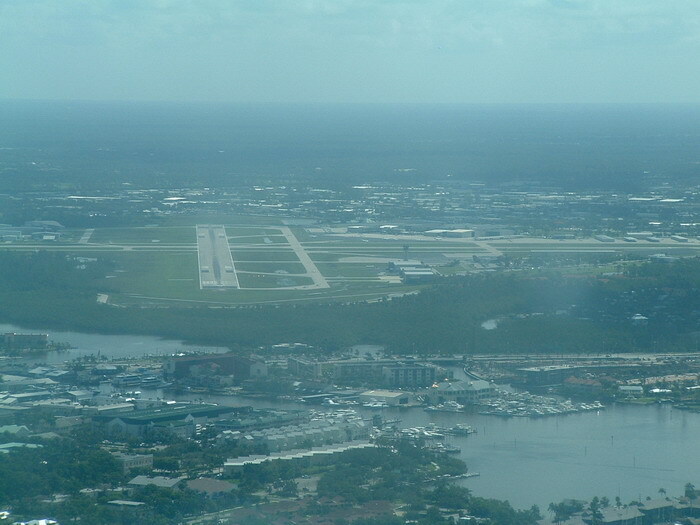 First up we do a ILS9 approach into Fort Pierce ending at 900ft as there were aircraft landing at the other end. Then he directed me to hold west of the Vero Beach VOR on the 270 Radial. I quickly determoine it will be a parallel entry and as soon as I am established inbound I'm given the full approach to 29L at Vero Beach. I had not done this before and after a moment flying outbound on a 115 degree heading I switch over to the 115 degree course outbound from the VOR, and start the procedure turn. I again went with a parallel turn and while both are acceptable since it's a 180 degree change, the examiner mentioned later that he'd have prefered a teardrop. He also failed an engine on me here, which is allways helpful. 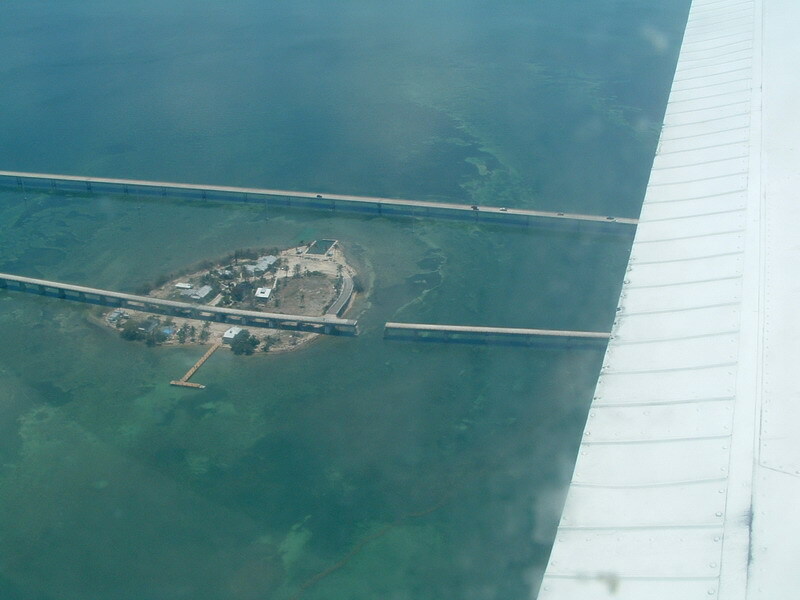 On the missed approach point we head back for the NDB-A into Fort Pierce. Job done! Another student here also passed their checkride this morning, so the gang are all going out tonight to celebrate. The next phase is timebuilding. Basically, 'Heres a plane and all the fuel you want, fly for 100 hours'. So this should make this website more interesting, as I now have the freedom to go places and take photographs. Any suggestions on place to visit? Key West and The Bahamas are already on the list!